This is amazing do you realise that a supporter of Cull is related to one of your sources? It’s last election time when DCC debt issues last reared their ugly heads … and I commented. Since then, it has all gone further pear shaped (watermelon shaped?) down there … but just to cheer you all up … hows this? …. for up here? It took 150 years of local Government for Auckland Councils to rack up $4 billion of debt. BUT! … it has taken less than 6 years for the amalgamated Auckland Council to more than double this to $8 billion … some say as high as $10 billion. And we have zip to show for it. No new major infrastructure, no stadium, a $1.2 billion (yes that’s billion) blowout on the IT system … an IT system costing $1.5 billion FFS! It’s getting to the point that a central government move to de-power LG … BIG time is now on the cards. Turn ’em all into sinecure-community boards and instead form GCO (Government controlled) infrastructure organisations NZ wide. The LG sector has (by and large) totally failed to earn our trust and has proven to be just a rabble of self-interested bozos*. * My “professional” (but with considerable disappointed-sadness) … opinion. Hi Larry! Always a pleasure to hAve you call by. Indeed I was looking up your local government league tables just a couple of days ago…. Our DCC cumulative rates increases under Mayor Cull’s ‘guidance’ in the last six years – for a +50,000 rating base means our per capita debt is second only to Auckland’s. So yep, things are going real well here in the south. Not. 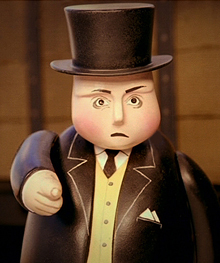 Fat Controller? Doesn’t look controlled to me. Irascible Headmaster? Well, when you have a class of ‘dunderheads’ in front of you is it any wonder. Hard enough as it is to construct such a convoluted exercise in mesmerising manipulation, then to be harangued by one tousled haired damsel on every little point. Still, one has been blessed by the dopey blank eyed majority led by departing Cr Thomson and abetted by the chairmanship of Mayor Cull. Mention must also be made of the efforts of my associate financial wizard pulling the wool so easily over all their eyes with the exception of the aforementioned damsel and Cr Vandervis, who can spot a set-up from twenty paces. His reaction was enough to make a normal group of people have at least the tiniest bit of doubt, sufficient to either call for pause till the new Council is in place post election, or also abstain. But no, not this bunch of nincompoops, they simply washed their own brains and did as instructed. Result. If this is not reversed then the ratepayers will be the poorer for probably in the fullness of time, in excess of $30-$35 million. Galling when it need not be so. Southern mayors have been accused of electioneering after hitting out at National’s local government reforms. The criticism came from Local Government Minister Peseta Sam Lotu-Iiga, after mayors across the South criticised the Better Local Services reforms as an attack on local democracy. Mayor Cull may have said that a month ago, but on 1 August this year his Council allowed the Delta debacle to go into full bloom. This after years of inadequate Council governance over Delta, its finances, losses, unlawful subdivision activities, and ratepayer-subsidised tendering for civil construction work in the marketplace. Local Government Minister Peseta Sam Lotu-Iiga announced on Friday a delay to the Better Local Services reforms which had caused an uproar across the local government sector. The proposals, introduced to Parliament as the Local Government Act 2002 Amendment Bill (No2), would give the Local Government Commission a suite of new powers. That would include the ability to impose council-controlled organisations (CCOs) on councils, even against the will of their communities, and transfer public assets into the ownership of the new entities. “I acknowledge some of the concerns raised by local government. Solutions need to be found that promote local democracy, while ensuring better quality services and better value for ratepayers,” Mr Lotu-Iiga said. Some southern mayors are claiming victory after reforms said to threaten the fabric of local government were placed on the back-burner. But the move has also prompted a warning from Clutha Mayor Bryan Cadogan that the fight is not over, as Wellington will probably “keep the foot on the throat” of the local government sector. […] Invercargill Mayor Tim Shadbolt said the delay was “a great victory” that meant dropping the worst of the CCO proposals was now “definitely on the cards”. “I think time will benefit us more than it benefits them. The nearer it comes to national elections, the more likely it will be the case,” he said. I suspect Larry that any local government depowering that’s done by this government will involve putting the very core services that councils should be looking after into pooled council controlled corporate entity privatisation waiting room. Such assets and related non-discretionary services include water/sewage/roading/drains/flood protection/consents etc. This work must be completed, inspected by us and certified by us (for an additional fat fee) by December 31 this year. If the house is not compliant by that time, you will be required to vacate the property until it is compliant. In order to assure your safety, and to ensure the work is done to a high standard (and we get our kickbacks) the work must be undertaken and signed off by one or more of the approved providers listed in the enclosed booklet. On absolutely no account must work be undertaken by yourself, and this includes cleaning the toilet seat (which has been condemned). We appreciate that as an elderly widow on a state pension you may not be able to immediately fund the estimated $65,000 cost of these works (or pay the c. $1,700 a month rental for an equivalent property if we get you kicked out of your own home). Your comfort is our first concern, so if this is the case we are delighted to introduce you to our new approved home equity release partner JonKey, Brown and Lee (JBL) Ltd of Panama. Unbelievable? – Just you wait and watch! These core non discretionary services will be duly privatised and we will be screwed royally ’til kingdom come’ courtesy of the TPPA. Such are the rights that foreign companies will enjoy that it actually makes sense to domicile them in a TPP signatory country. We will get to pay for all these services separately, while our ‘depowered’ councils continue to increase the rates to pay for their non core ‘depowered’ fluff – such as Mayoral visits overseas/economic development/events promotion/stadia for example. Now this is far worse legal news than wine heirs getting away with it. Retrospective legislation, whether you agree with the outcomes of it or not, strikes at the very core of modern democracy as it strikes at the rule of law. While in a Westminster democracy Parliament can do pretty much what it likes as far as making laws are concerned. Changing laws retrospectively is another matter altogether. If you cannot rely upon the law being what it is on the day that you decide to do something – or not to – or have something done to you, then there is no law. It started with retrospective planning consents in places like Queenstown and appears to have worked up to more serious levels. Now Acts of Parliament that extinguish verdicts of guilt or innocence have started to become semi-routine, and it is a menacing development. Not since the routine murders of Henry VIII via parliamentary Acts of Attainder that bypassed the courts have we seen this kind of routine abuse of parliamentary sovereignty. This instance is not even a very important issue, no major matters are at stake. I am unaware of it happening in any other established democracy, but I stand to be corrected on that. At the moment calling the prime minister a twit today, on this website is not a capital offence – but be careful, it actually could be – if this kind of thing gets a grip and the then incumbent turns mean in 2021 or whatever, then the words you place on this website today could get you hanged in the world of retrospective legislation. Remember, both major parties (and the Greens) have voted recently to place retrospective legislation on the statutes, so this is a truly parliamentary, not simply a government disease. If there ever is to be a confrontation between the Supreme Court and Parliament, then this is undoubtedly the issue that is most worthy of it. Retrospective legislation needs to be looked at on a case by case basis. Without retrospective legislation, the extermination of Jews in WWII would not have been a war crime. And in some countries aggressive tax avoidance by multinationals using loopholes, has been corrected by retrospective legislation. The NZ Bill of Rights act has a prohibition on some retrospective criminal legislation, and guidelines on what can and can’t be retrospective, so no need to be paranoid about being hanged in 2021 for calling the Prime Minister a twit in 2016. Retrospective legislation is immoral. It’s the tool of corrupt dictators. It belongs in Scamsville BR (Banana Republic) along with dictator protection by CIA. It has no place in any democracy. New Zealand is better than that, pity some of our politicians aren’t. “It started with retrospective planning consents in places like Queenstown” – but before that, the Clyde Dam. They hadn’t even done the work on earthquake faults! Nor hill stability. It was “planned” and remediated on the fly! If a bureaucrat can screw you – he will. Like I’ve always said – a Rugby Pool. A rare prosecution of alleged corruption in the New Zealand public sector has heard of a claimed cascading culture of bribery that saw a senior Auckland Council manager collect $1.1 million and his subordinates taken for a $3000 lunch. The alleged gratuities extended to honeymoon expenses in Florida for the daughter of a senior council staffer, dozens of overseas trips, and regular monthly payments of about $8000 into the pocket of former Auckland Transport senior manager Murray Noone by roading contractor Stephen Borlase. Noone and Borlase yesterday pleaded not guilty to charges of corrupting a public official by bribery. Borlase, whose road maintenance firm Projenz is at the heart of the case, also declared himself not guilty of charges he inflated invoices. 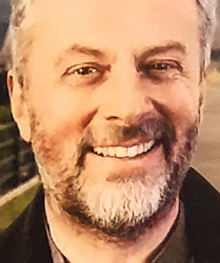 Crown prosecutor Brian Dickey said part of the Crown’s case is that Borlase arranged matters so the Rodney District Council – and later Auckland Transport – effectively paid to have their own staff bribed. Justin Lester has some explaining to do and not just about his activities on the ratepayer’s dime in Hong Kong. It seems the council, under his chairing of a key committee, has managed to magic away $8million of ratepayer cash in a corporate welfare payment to Singapore airlines…and all that exists in terms of paperwork is a Powerpoint presentation delivered after the deal was done…and a two page document that barely mentioned it. “A decision to subsidise Singapore Airlines new Wellington flights for the next decade saw virtually nothing put in writing. A rare prosecution, but a common problem. In Auckland just one prosecuted, in Dunedin one man stole 152+ cars SINGLEHANDEDLY. But-but-but Gurglars, there couldn’t possibly be more than one dishonest person in the building!